Droughts Are Increasing - What Are The Impacts? Water Matters > News > Droughts Are Increasing - What Are The Impacts? With warmer worldwide temperatures, due to climate change, come more and more extreme weather events. While the inherent drama of raging hurricanes and wildfires grabs headlines, the slower burn (literally) of drought poses just as much long-term harm. 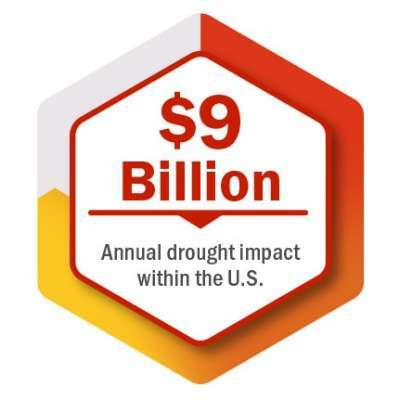 As recently as 2012, 81 percent of the United States was experiencing abnormally dry conditions, which made expensive economic dents — $30 billion worth. While they generally develop over a period of months and years, droughts are becoming more of a looming threat, particularly in already water-strapped areas of the country, like the southwest. Drought is sort of like getting a flu. It might start out with mild symptoms that a person (or in this case, a community) can power through, but once it gets into its full swing, it can really take a person (or rather, a geographic area) down. Then suddenly seemingly out of nowhere, offices are empty, and no one can get out of bed. Droughts take their time developing, but once they’re full blown, they have far-reaching, painful consequences. According to the World Health Organization, more than 850 million people worldwide lack access to safe, clean drinking water. This figure becomes all-the-more-dire considering the increasing frequency of droughts around the world. Already some cities are facing the prospect of running out of water. One such city is Capetown, South Africa. A popular tourist destination, Capetown has seen three years of far below average precipitation, and its water shortage is made worse by a growing population that now stands at four million residents. Authorities there and in many other cities are looking for fast and creative ways to conserve freshwater and desalinate global water. Again, much like getting the flu, when our environs suffer a drought, there’s fallout far beyond dry riverbeds, and suffice it to say that drinking water and drought are two things best not to mix. (Of course, does anything work well with a drought? Nope.) Impacts of a drought are felt throughout an ecosystem, and are usually measured in direct and indirect terms. A direct impact would be the immediate result of less drinking water being available. This includes if there’s lower crop yields — like, say, fewer oranges because California orange groves were heavily impacted by California’s drought. Indirect impacts would be stores that have lower sales, in part because they don’t have those oranges to sell, and also because that orange farmer and his employees have less work and therefore they have less cash flow. A further indirect impact would be the rising price of those oranges as supply wanes but demand remains the same. All of this begs the question: what impacts do these droughts have on overall water quality? Turns out, it’s a lot. Drying surface soil and dead plant matter can lead to erosion and significant increases in runoff when precipitation does return. Drying brush also leads to wildfires which in turn lead to erosion and runoff as well. That means more elements that would otherwise remain in soil end up in the freshwater supply and increase turbidity (i.e. they make the water cloudy). If one of the elements leaching into water is nitrogen, algal blooms can flourish making the water cloudier and increasing the risk of toxic cyanobacteria growing in the water. This then has a domino effect by making the water ever-cloudier and making it tougher for the sun’s UV rays to penetrate the water and disinfect it, which allows the algal blooms to grow even more. On top of that, the concentration of sediments and other undesirables in the water increases because there’s less water. Drought is a huge contributor to this cycle that’s tough to stop once it gets going. Almost like getting bronchitis or pneumonia after having had the flu — the difficulties just pile on top of each other, making them all more extreme and sometimes even dangerous. So, what can ordinary citizens do to prevent drought or at least make them less painful? What’s the drought version of a flu shot? The answer lies in water conservation.